Tetratab | Dual Bearer Devices: are they suitable for military use? When it comes to small caliber ammunition acquisition, many instinctively think of large ammunition production companies manufacturing massive quantities of tactical and training ammunition. For the past five years, the production levels of the 7.62 mm caliber ammunition alone have consistently exceeded 160 million rounds annually. Meeting the high-volume production levels for small caliber ammunition is challenging for small companies, to say the least. The Army has taken great strides to partner with small companies to develop small caliber ammunition technologies to address capability improvements. Prior to the development of the Enhanced Performance Round (EPR), research and development (R&D) efforts in the area of small caliber ammunition were limited and difficult to initiate because, until only very recently, the Army had not captured small arms ammunition capability needs in capability development documents (CDDs), which meant that there were no approved operational requirements and no funding. In recent years, greater emphasis has been placed on improving small caliber ammunition performance to address documented capability gaps. This led to developing 5.56 mm- and 7.62 mm-caliber specific CDDs, which were approved through the Joint Capabilities Integration and Development System in early 2015. With these in place, the Army could seek help from industry in identifying and maturing technologies to eliminate these gaps. And because there was little interest from traditional ammunition manufacturers in spending a significant amount of resources in lighter case material, that meant looking to small business. One of the Army’s top priorities is to lighten Soldier combat loads. Reducing the weight of equipment carried by the warfighter, often referred to as “Soldier load,” increases agility and endurance. In post-combat surveys, Soldier load ranks among the top concerns of combat veterans. Emerging light ammunition designs offer substantial reduction in combat load given the necessary R&D to develop the technology for military use. For example, replacing the current brass cases with lighter-weight materials would reduce the Soldier’s ammunition load by 20 to 30 percent. Since 2013, the Project Manager for Maneuver Ammunition Systems (PM MAS) has worked with small companies in developing the 7.62 mm Lightweight Small Caliber Ammunition. Efforts to reduce the weight of 7.62 mm ammunition are underway through a DOD Ordnance Technology Consortium (DOTC) initiative, a vehicle whereby small businesses partner with DOD to develop cutting-edge solutions. Through DOTC, PM MAS and the U.S. Army Armament Research, Development and Engineering Center are working with multiple small companies to develop lightweight polymer cartridge cases for 7.62 mm machine gun ammunition. Although the small businesses have made improvements in lightweight cartridges, the path has not been without its challenges. Small companies are bringing innovative and novel solutions to many of the Army’s problems, including small caliber ammunition capability gaps, often taking technology from another commercial industry application and applying it to ammunition to meet warfighter needs. Today, small businesses have been able to reduce the weight of 7.62 mm cartridges by approximately 20 to 25 percent compared with the same cartridges with brass cases. The difference between the traditional brass case and new polymer cases is more significant than just weight. To be as good as or better than brass, such polymer cases must interface with the weapon system in the same way that brass does. As such, the small business contractors must be aware of how, for example, an M240 machine gun functions and how it grips the ammunition. This understanding of the weapon helps the contractor in the design of their polymer case and can provide insight into key stress areas that can cause cracks or ruptures. However, small companies have encountered challenges in this regard as a result of their limited knowledge base and experience with the weapons and ammunition as a system. Small companies provide a level of energy, focused subject matter expertise and innovation that is valuable to R&D efforts. Their passion for analyzing problems and defining solutions is a great asset to the Army. However, partnering with small businesses presents challenges that can affect government program schedules. Although small companies maintain control of their design and have the ability to make design changes quickly, unlike their large industry counterparts, they sometimes lack the resources to quickly test and evaluate the impact of the changes they make. Additionally, small companies that PM MAS has worked with in small caliber ammunition R&D tend to rely more heavily on subcontractors for production. Their reliance on subcontractors to implement their design changes and produce new test assets can increase build-test cycles, which in turn can result in schedule delays. For example, the small businesses performing work on the DOTC initiative can only partner with the limited number of companies working on nontraditional ammunition cases for their components (i.e., metal head inserts, bullets and propellant) and polymer injection molding. Typically, the small business orders tend to get lower priority when competing with other high-volume customers from the government or commercial industry. And when designs change, there tends to be considerable back and forth between the lightweight ammunition small business contractors and their component-manufacturing and injection-molding subcontractors to obtain an optimal solution. The iterative design process of build-test-fix becomes more cumbersome because the small businesses don’t have all of the functions under one roof. This, in turn, can make it more difficult for them to meet scheduled delivery orders. An additional challenge when working with small companies is the high-volume production levels typically required for small caliber ammunition during production and deployment. Small companies tend to focus on developing and providing a solution. At the same time, they may have limited understanding or expertise on the impacts of transitioning from prototype to high-volume production. Integrating those solutions in development with manufacturing technology becomes more challenging. This often requires the government to act as facilitator between the solution developer and the ammunition manufacturer to ensure appropriate manufacturing readiness levels before transitioning from prototype to production. Both the Army and small company partners need to properly understand and plan for the impacts of concept or technology transition to high-volume production early in development. Since 1939, a large portion of DOD small caliber ammunition production capability has been built at Lake City Army Ammunition Plant (LCAAP) in Independence, MO, a government-owned, contractor-operated facility. With a capacity of nearly 1.5 billion rounds of ammunition per year, LCAAP has the capability to meet high production demands that are uncommon to many smaller companies. Small businesses often consider transitioning to production, but cannot achieve the volume or surge capability required by the Army. They can also be daunted by the exacting standards that the Army requires. Because of this, the government often seeks to obtain “government purpose rights” when partnering with such small companies. Government purpose rights enable the Army to hire small businesses to solve a particular problem that larger businesses can’t or won’t tackle, but then transition those solutions to manufacturing by soliciting production contracts from larger businesses that are capable of meeting the high volume of small caliber ammunition production required by DOD. Technical data initiated by small business is often proprietary; therefore, obtaining the rights for transition to production requires substantial negotiation because the DOTC initiative does not allow the Army the opportunity to obtain technical data rights. There is no doubt that partnering with small businesses presents its own set of challenges, but there are also significant benefits for the small caliber ammunition R&D programs. As was the situation with lightweight ammunition, small businesses are more likely to already be exploring new and novel corners of the market and are able to make great strides with relatively little investment. With smaller amounts of funding available for initial technology maturation and demonstration, the Army is able to provide additional funding in an area that a small business has already begun exploring. Additionally, the Army is able to team with the small business by providing technical expertise to which the small business may otherwise not have access. For instance, the Army has extensive experience in the M240 weapon system and in-depth understanding of the system-level stresses through tools such as finite element analysis, a computer tool that can predict how the ammunition would react to real-world use. With that kind of technical feedback, small businesses are able to effect change in the design and process much more rapidly than large defense contractors. This is the result, in part, of small businesses typically offering flatter organizational structures and, in turn, streamlined decision-making processes. The small business is able to implement changes in the process and product much more quickly and less expensively than larger contractors. The ability to communicate openly and make nearly instantaneous decisions is key to developing unconventional solutions such as polymer-cased ammunition. 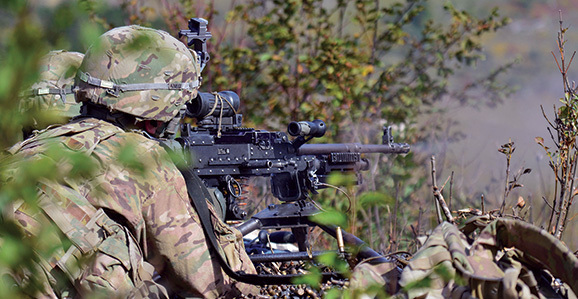 It is their years of experience in working with polymers and their understanding of how the material responds that make the partnership between the government and small businesses essential for the development of lightweight ammunition. Aside from early planning for obtaining government purpose rights, there are some lessons learned that should be considered in developing professional relationships between the government and small businesses. The most effective way of overcoming issues is communicating a common understanding of the end state. It is the government’s responsibility to inform industry partners at the outset of its strategy and expectations. This can be done through industry day events, market surveys and early communication of performance expectations and future production requirements. The government must view the relationship as a partnership, acknowledging and overcoming the various challenges to establish mutual understanding and trust. As the Army and PM MAS seek to fill small caliber ammunition capability gaps, there are opportunities to leverage the strengths that small businesses have to offer. The benefits of working with these small companies far outweigh the challenges, which can be addressed through early communication of program milestones, realistic deliverables and a clearly defined end state. For PM MAS, the journey in developing innovative solutions, such as lightweight cases, and transitioning them into high-volume production is just beginning. In the end, it’s crucial for the Army and industry partners of all sizes to work together in developing and fielding innovative solutions to ensure that our warfighters maintain small arms overmatch for years to come.